Debbianne is an author, speaker and mentor based in the Bay Area. She brings much-needed humor to the Metaphysics and Self-Help genres. Her books include the popular primer for single gals, "How I Met the Man of My Dreams: a Guide to MANifesting Yours," "The MANifesting Workbook," and a hilarious memoir, "What I Did On My Midlife Crisis Vacation." 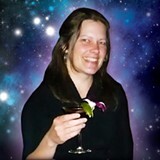 Visit Debbianne.com for thought-provoking, giggle-inducing angles on this Universe thingy we're living in.